Chilled desserts full of cream, marshmallow, or mousse were very popular with housewives of the forties and fifties when the potential of the home refrigerator was still being explored. From bombes and baked Alaskas, to mousses, meringues, marlows and mallobets–cookbooks of that era celebrated them all. 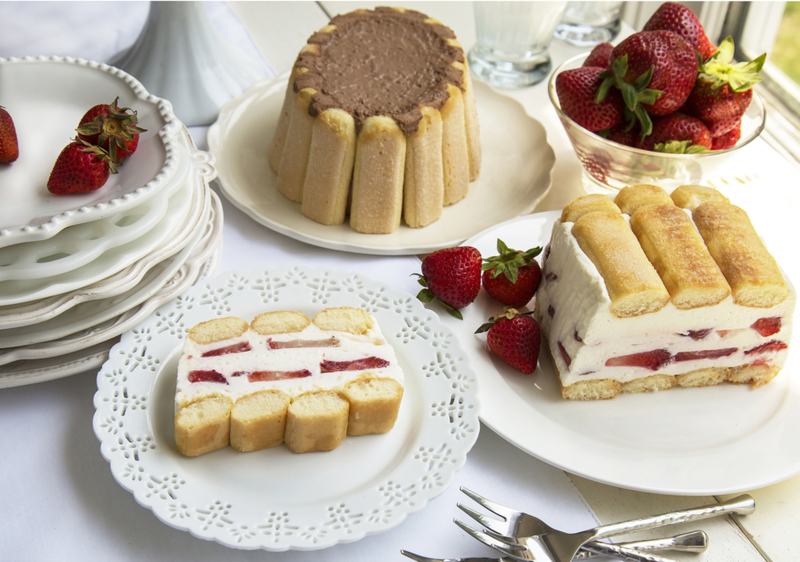 Steering around the mallow, and more-dubious creations like the Fig Banana Brick (yes, that was a thing) we’ve revisited two icebox cakes: a Chocolate Mousse Icebox Cake from the ’40s, and, a Strawberries and Cream cake, with sherried berries (yum!) that tastes even better than strawberry shortcake. Both no-bake desserts layer fillings over ladyfinger cookies, which soften and transform to cake fingers as the desserts set. The only “fiddley” part of this recipe is lining the molds with waxed or parchment paper, but it’s worth the effort as this makes it a snap to invert and remove the dessert from the mold when it’s ready. You’ll have to cut the paper to fit the mold. I use a little liquid coconut oil on the paper lining the sides of mold to help it adhere. Soak gelatin in cold water for five minutes to bloom. In the bowl of a stand mixer, whip cream, beating in 1/4 cup sugar gradually, until soft peaks form. Heat bloomed gelatin in microwave for just a few seconds until liquified–should be hot, but not too hot to touch. Add liquid gelatin all at once to whipped cream in mixer bowl and beat for 30 seconds at medium speed to smooth consistency. Line a loaf pan with waxed or parchment paper, lengthwise and widthwise, leaving excess waxed paper hanging over the edges of the pan. Line bottom of pan with lady fingers, (sugar side down, if using sugared lady fingers.) You may have to cut lady fingers to fit. Sprinkle with wine or sherry. Spread a layer of whipped cream over the lady fingers. Over this, press sliced strawberries in rows to cover. Repeat the whipped cream and strawberry layers. Finish with ladyfingers. Sprinkle again with wine or sherry. 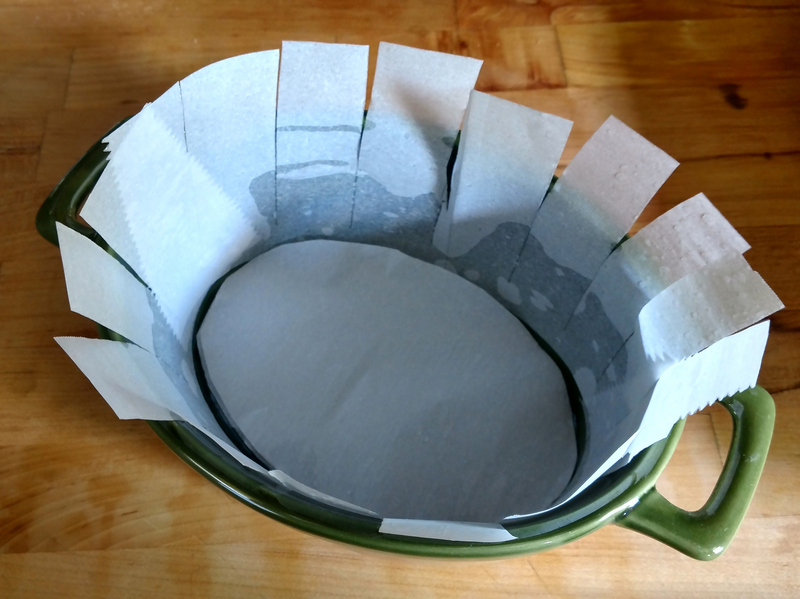 Fold waxed paper ends from the sheets you layered into pan at the start, over the cake. Cover with plastic wrap. Chill overnight. To unmold, remove plastic wrap. Grasp ends of waxed paper and lift dessert out of pan. Invert onto cake plate and remove waxed paper. Slice to serve. Whip equivalent of 8 egg whites (using liquide pasteurized version) until they hold a peak. Set aside, keeping cool. Whip cream. Set aside, keeping cool. Remove chocolate pan from above the boiling water. Whisk egg yolks into the chocolate mixture, one at a time, beating thoroughly after each addition. Once all are incorporated, replace chocolate pan over boiling water and cook 2 minutes more, whisking constantly. Add vanilla; cool. Fold cooled chocolate mixture into egg whites. Refrigerate for about 20 minutes. Fold in whipped cream. Line bottom and sides of your mold or molds (you can use anything you like--I prefer to use an oval) with waxed paper, making sure waxed paper pieces are large enough to have excess hanging over the edges of the mold. For the sides of the mold, spray with a little nonstick cooking spray or liquid coconut oil. You may have to cut the paper to make it fit. I've included a photo of the liner I cut for the mold I made (see above.) Stand ladyfingers around the inside of the complete circumference of the mold. Depending on the depth of your chosen mold(s) you may have to trim the ends off of the ladyfingers to ensure they don't extend above the top of the mold. Fill mold halfway with mousse. If you like, arrange a layer of ladyfingers over the mousse, cutting them to fit. Fill the rest of the mold with the remainder of the mousse. Cover with plastic wrap and chill for 12 to 24 hours. Mousse will firm up nicely and lady fingers will soften, but hold their shape.